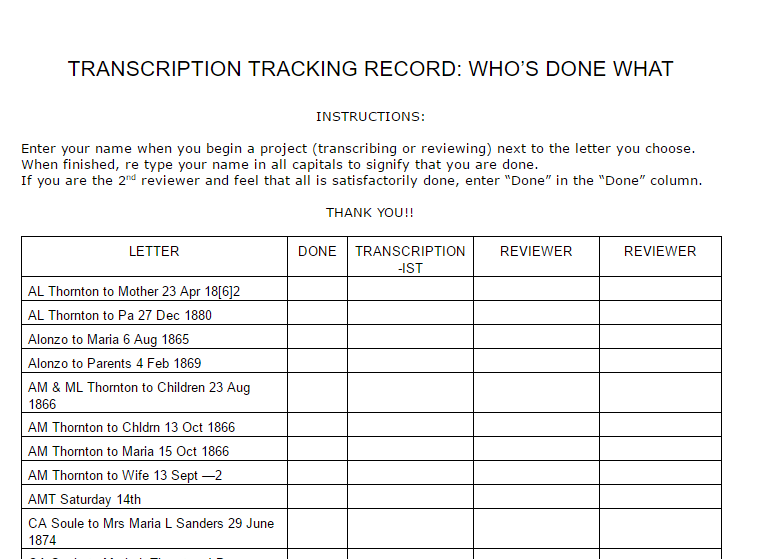 Do you have a letter collection or ancestor journal that you’d like to transcribe, but the task seems overwhelming? I previously shared my friend Karen’s experience with inheriting over sixty family letters from 1828 to 1921. She learned how to archive the letters and developed a great system for enlisting the help of other family members in transcribing them. Today, with her permission, I’m sharing the steps she took. Karen and her sister first took the letters to the Special Collections Department at Brigham Young University. The staff instructed her on how to care for and preserve them. She built a hydration chamber so that she could safely press the letters before storing them in safe archival vinyl sleeves. She found all needed supplies in local stores at low cost and by following the directions carefully, the letters can now be viewed easily without damaging them. The next step in the transcription project involved scanning each letter as well as its envelope. Karen decided to do this in PDF format so all the pages of a letter and it’s envelope would be kept together. One PDF for each letter or postcard, scanning every paper with anything on it. Karen needed a way for family members to access the digital images from their computer and then transcribe the documents. 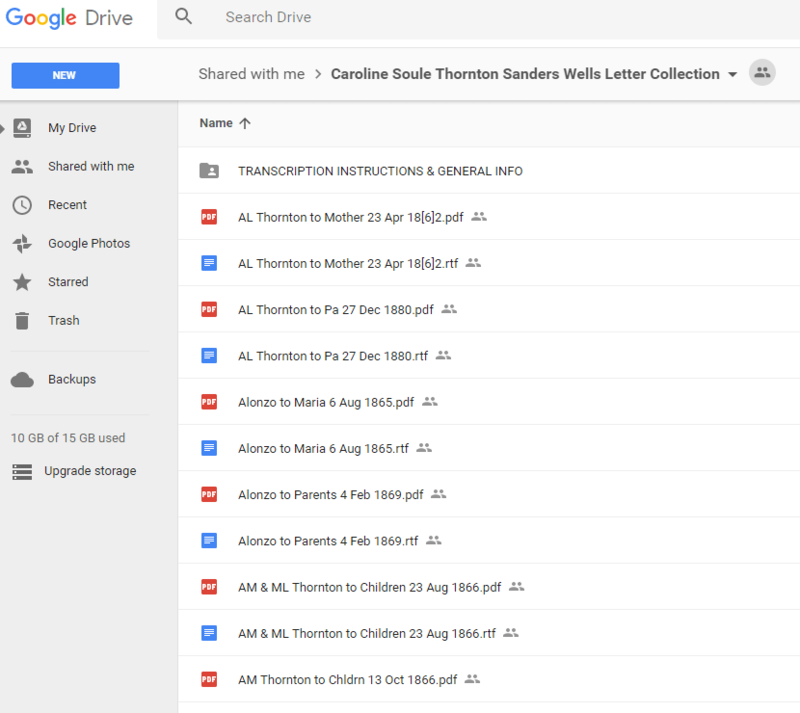 She opted to use the sharing capabilities of Google Drive to create a file that would include the PDF of each document and an accompanying Google Doc where helpers would type the transcription. 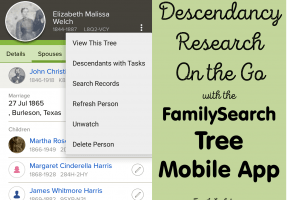 She added biographical information on the writers of the letters, a family transcription guide, and a genealogy chart of all the family involved in the letters. Once the file was in place, she shared it with any family member willing to help with the project. Notice in the screenshot below, that each PDF (red icon) of a document is followed by a Google Doc (blue icon) of the same file name. To the right of the screen (not shown) is a column that names who last modified the document and the date, so there’s no question who’s working on what. Knowing that not everyone would be Google Drive and Google Doc savvy, Karen included detailed instruction sheets complete with screenshots for the project. She used the tips she learned at BYU and researched more about handwriting from the 1800’s to create a help sheet for deciphering old handwriting. (PDF’s shared with her permission below). Karen created a separate Google Doc (shown below) for the family members to fill out as they worked on a particular document. Each letter was to be transcribed then reviewed by two other individuals. The beauty of Google Docs is the ability to add comments. So if one reviewer didn’t agree with a word, he could just highlight the word or phrase and type in his opinion in the comments. Karen’s attention to detail in the process is impressive. I love the whole idea of peer review that she’s incorporated. 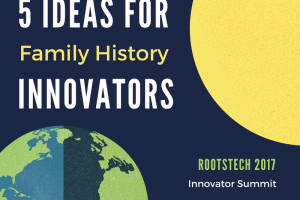 What a fabulous project to share with your family. 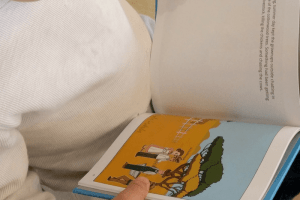 Only one person can be the caretaker of precious documents, but with the capabilities of technology, all can share in the enjoyment and process of using those documents to learn more about family. 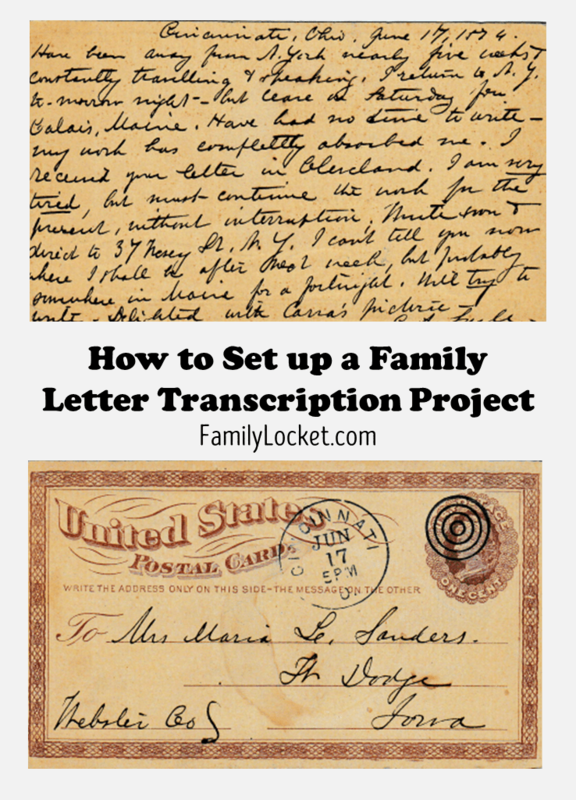 Whether you have a large or small collection of letters or a an ancestor’s diary or journal, setting up your own family transcription project just might be a perfect way to get other family members involved in this great work. Best of luck in your family history efforts!